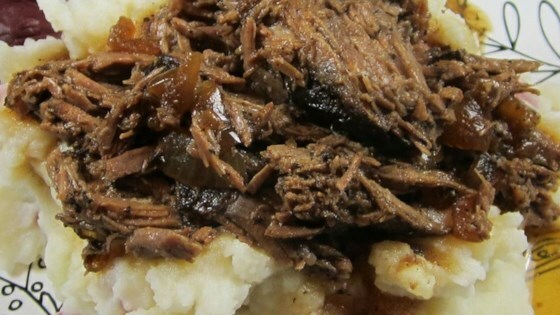 "Delicious pot roast and onions in a savory sauce in the slow cooker." Season roast with salt, pepper, and garlic powder. Heat a skillet over medium-high heat. Cook roast in hot skillet until browned on all sides, 3 to 5 minutes per side. Place roast in a slow cooker and scatter onion slices around roast. Pour vinegar over the roast and onions. Cook roast in the slow cooker set to Low until tender and falling apart, 6 to 8 hours. Shred meat and return to slow cooker with juices. See how to make a super simple, tender pot roast in the crock pot. Did not care for it. The Balsamic was too overpowering. It's amazing! Especially the onions!